If that’s the case – and I believe it is – it’s creating another great investment opportunity. Diageo (DEO), one of the largest alcohol companies in the world with a market value of $87 billion, is potentially looking to buy or invest in a Canadian cannabis company. The Diageo deal whispers are creating a great opportunity. In the short run, shares of the company that Diageo partners with should see a big surge similar to Canopy. Diageo’s global brand and distribution network would be great for any cannabis partners. 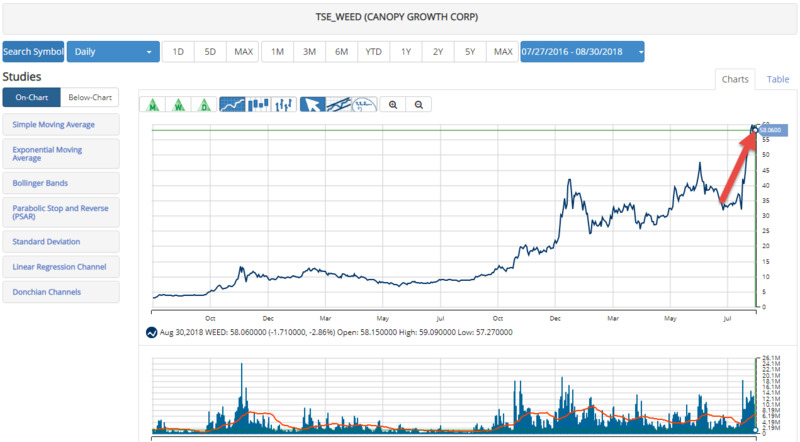 Right now I see two early industry leaders in Canada that jump out as high probability targets. 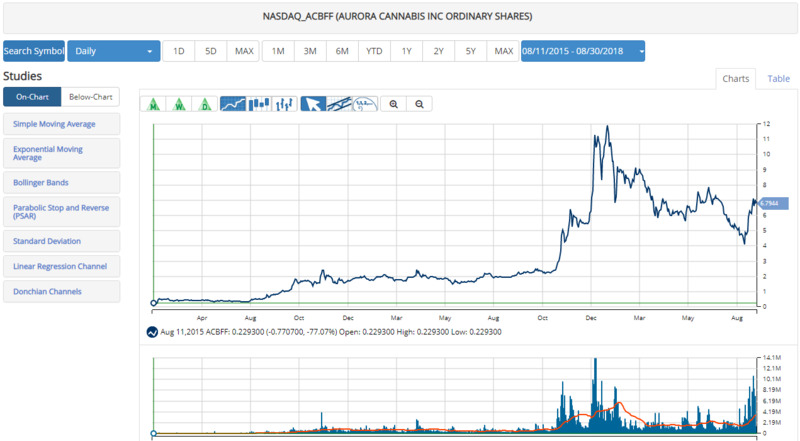 Aurora Cannabis (ACB, ACBFF) is the second largest cannabis company in Canada behind Canopy. Like Canopy, Aurora is an early industry leader, benefiting from first mover advantage and aggressive cannabis production. 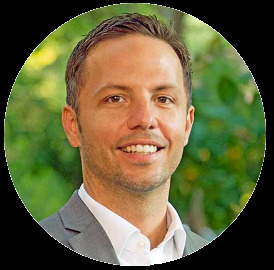 For example, in April Aurora announced it had acquired 71 acres of land to build a high tech, 1.2 million square foot cannabis greenhouse. Here are a few more details from Aurora. The new facility, to be designed and engineered by the Company’s wholly-owned Aurora Larssen Projects Inc. division, will be named “Aurora Sun” in recognition of Medicine Hat’s status as the sunniest city in Canada, with more than 2,500 hours of sunshine per year. At 1,200,000 square foot, or over 21 football fields, the footprint of Aurora Sun will be 50% larger than Aurora’s Sky, a 100,000+ kg per year Health Canada licensed facility the Company is completing at Edmonton International Airport. These new greenhouses have Aurora on pace to be one of the lowest cost cannabis producers in the world. After surging deep into a new all-time high, Aurora spent the first half of 2018 in a downtrend. Today, shares are rebounding, but still trading 40% below the 52-week high. I expect Aurora to hit a new all-time high by the end of 2018. 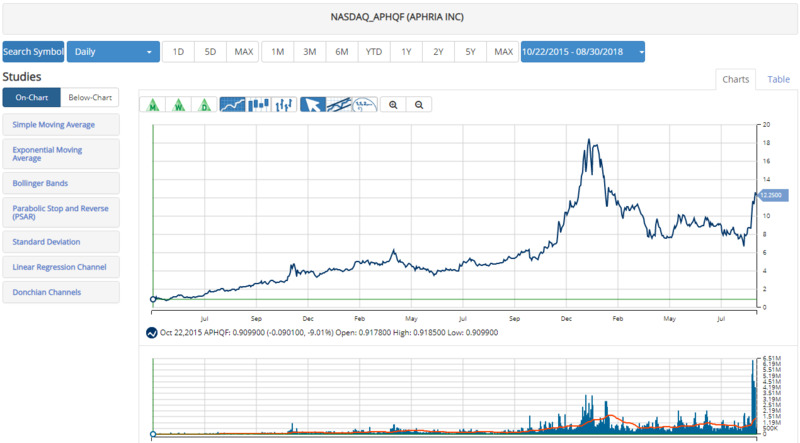 Aphria (APH, APHQF) is also one of the largest Canadian cannabis companies and an early industry leader. Aphria looks like a great target because it is a company with great international exposure. For example, on July 26 Aphria completed its largest export ever to Australia-based Med Lab. In early July, Aphria announced its expansion into Latin America and the Caribbean with a few acquisitions. Aphria is already cashing in on Canada’s rec market. Aphria just signed a supply deal of more than 50,000 kilograms with British Columbia. After surging deep into a new all-time high in 2017, Aphria saw a pretty steep pullback in the first half of 2018. However, shares recently rebounded sharply and look ready for a reversal and new bull market. Similar to Aurora, I expect Aphria to rally in the next few months and close 2018 at a new all-time high. Some good news on a potential deal or buyout is already priced into shares. But I still expect shares to surge on any news of a deal. Canopy’s deal with Constellation has triggered a mad scramble. Big alcohol is in the early stages of pouring tens of billions into the global cannabis industry. This is a very bullish trend for investors. Diageo is shopping right now. Keep your eye on Aurora and Aphria – both look like great deal targets. in Per Share Price between Now and 2020. I believe it will be Aphria because both Ceo's ar acquainted with each other.